PureTech Health is building the biopharma company of the future with an advanced, clinical stage pipeline of new medicines targeting serious diseases caused by dysfunctions in the brain, gut & immune systems. For Investor Relations inquiries, please contact PureTech Health’s Investor Relations team at: ir@puretechhealth.com. For more information, please use the links to the right. Our share register is managed and administered by Computershare Investor Services PLC. 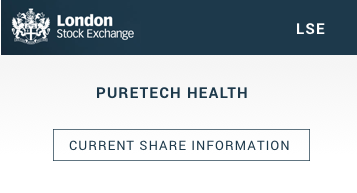 Computershare Investor Services PLC should be able to help you with most questions you may have about your PureTech Health PLC shares.